This drawing covers a section of the Lincolnshire coast from Humberstone in the north to Mablethorpe in the south. Down the right of the sheet, the sandy beaches characterising this stretch of the coast are represented by banks of fine dots. Salt marshes are indicated by areas of grey shading. 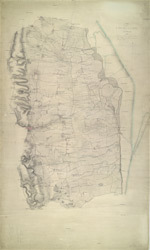 Further inland, the map shows the ditches and dykes constructed to drain the fens.